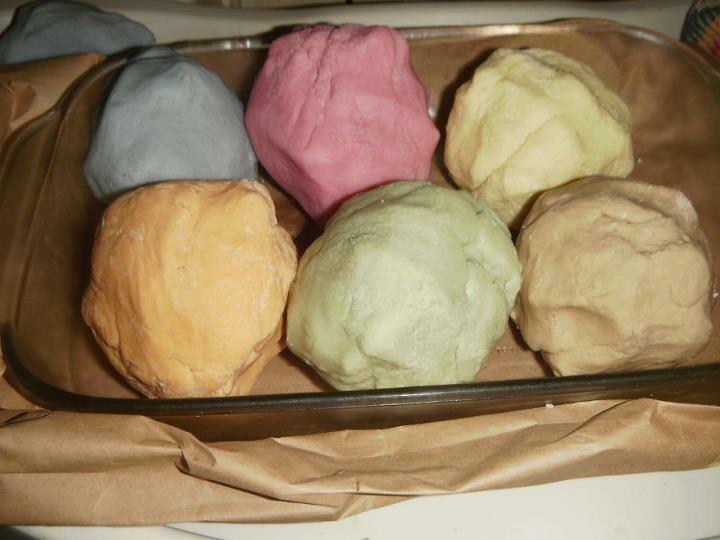 1st, the recipe I used for the play dough, which turned out absolutely perfect. This is the basic recipe. I tripled it to make enough for the 6 colors I was sampling. I think the following recipe would be plenty for 3-4 different colors of small balls. If you want to put a nice sized ball in the fridge, go ahead & double it. I mixed all dry ingredients together & then divided it into 4 small bowls (I did the other 2 colors later). I added the coloring to the boiling water before adding to dry ingredients. 1 C Flour (I used organic whole wheat because that’s what I had on my shelf- use what you have) ½ C salt (I used course Kosher) 1 TBSP oil (I used olive) 1 TBSP cream of tartar (the only thing I had to go buy that wasn’t on my shelves, I bought organic, but it was kind of pricey) ***Mix all those together. Then add and stir in quickly: 1 Cup boiling water 1 ½ tsp. Food coloring (more or less depending on how vibrant you want the colors!) *** Will seem kind of pasty. Let sit & cool 5-10 minutes and work into a ball. If it’s sticking to your hands, add flour little-by-little until it doesn’t stick. I divided each ball in ~1/3 & gave my babe 1 of each color to play with, and stored the remainders in an airtight Ziploc bag for up to a few months, until it seems hard & unworkable, then you know it’s time to make a fresh batch. What the dyes are made of (not 100% organic) BLUE: blue gardenia extract, organic vegetable glycerin, citric acid BROWN: caramelized sugar, organic vegetable glycerin, citric acid GREEN: green gardenia extract, spinach, parsley, organic vegetable glycerin, citric acid PINK: beets, sweet potato, organic vegetable glycerin, citric acid ORANGE: annatto seed, organic vegetable glycerin, citric acid YELLOW: curcumin, organic vegetable glycerin, citric acid *Colors may vary due to Natural ingredients. $60 for the set of 6. What I think of Maggie’s Naturals food coloring: I really wasn’t sure how much to use- some recipes I saw said 30 drops? Maggie’s doesn’t come in a dropper bottle, so I decided on a tsp. but then threw in another 1/2 tsp for good measure (for a total of 1 1/2 tsp per half batch of above recipe, or approx. 1/2 cup boiling water). I truly love how the colors turned out! They are very earthy & not fake-looking. They really look natural, BECAUSE THEY ARE! The amount of coloring I used for each batch barely brought the bottle down below the neck line- they were filled clear to the brim. The cost is the only downside. I know many on this page are mamas on tight budgets just like I am. I compare the cost to essential oils, (which is what they are) which typically run ~$10 for a 1 oz. bottle- Maggie’s are a 2 oz. bottle. I did find one other brand offering a similar product online- there’s are $5.99 for a .5 oz bottle, so comparatively, Maggie’s are a good deal! The folks at Maggie’s told me to watch their site for mix-n-match offers in the coming weeks. I never buy 6 bottles of essential oils at once though, but this helped my put the cost into perspective. Maybe you could split an order with a mama friend. Or, if you’re like me & your babe has plenty of toys, put Maggie’s on a X-mas wish list for g.ma & g.pa. I know this product isn’t for everyone (or their budget), but I often see mamas looking for natural ideas for coloring babe’s 1st birthday cake, etc. For my babe’s 1st b-day I decorated his blueberry cake with more blueberries spelling out his name & a big heart. 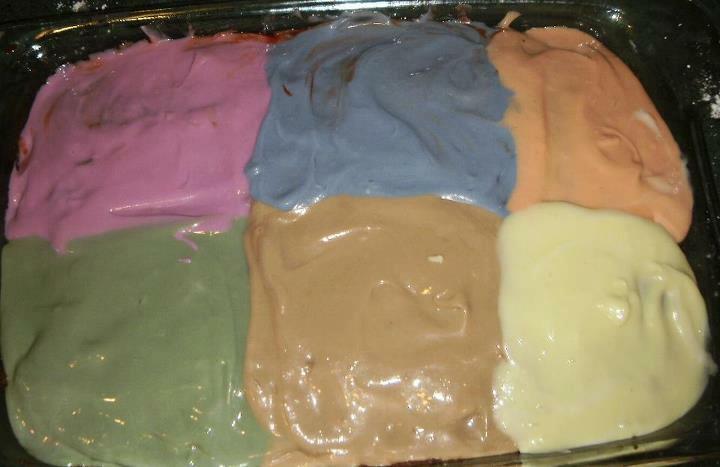 I’m really not a colored frosting kind of mama. But, I do however need lots of ideas to get me through a Wisconsin winter indoors with a toddler, and play dough immediately came to mind. Each color will provide enough for many, many projects & decorative confectioneries in the future. The true test was to see how my babe liked it. As always, he proceeded with caution, poking & prodding it a bit. I ran grabbed a few close by accessories, a butter knife, a few of his cups from Green Toys, a pen, a lid to flatten the stuff with, and helped him get started playing. I then proceeded to do the dishes & clean up my kitchen of the playdough making mess, while he happily squished, rolled & played with the dough balls for an entire hour, which is a reeeeeeeeally long time in toddler-time! SIDE NOTE: Maggie’s Naturals is owned by Maggie’s grammie Jan. The family also owns another awesome business, which I’m sure many of you are aware of: http://www.ecokidsusa.com/. Eco-kids is run by Maggie’s mom & dad. They offer eco-dough, finger paint, crayons, rolling pin, art pad, glue, egg coloring & party bags, all PROUDLY made in Portland, Maine.